Dibbleville Food Coop – High quality organic and natural foods are available through your local buying club at discount prices. Dibbleville Food Co-op is a Fenton, Michigan, food buying club/cooperative since the early 1970’s. 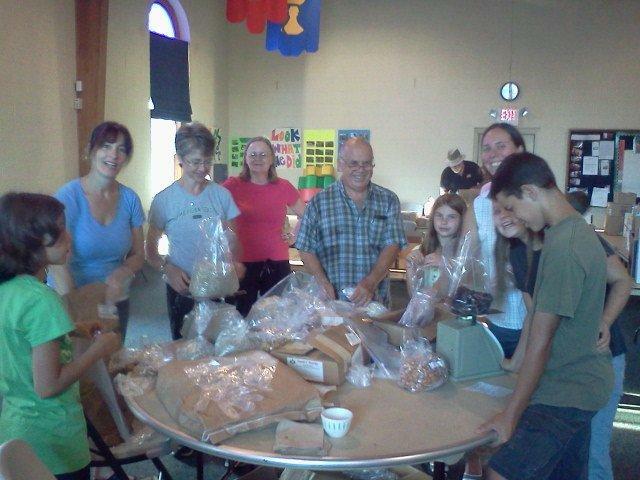 We are owned and operated by our member families and individuals, who order together every four weeks. Dibbleville combines its purchasing power to provide economic benefits to its membership by obtaining quality, healthful foods and goods at reasonable prices. The Co-op does not sell to members, it buys the products they want for them. Cooperatives are special forms of business ownership in which the receivers of a good or service own and control the organization with no one profiting at the expense of others. The first one began in England in 1844 by flannel weavers. The principles and practices known as the Rochdale Principles established by the weavers are still in place today. Two of the most important co-op waves started in the 1930’s during the Depression and in the 1960’s during social unrest. During the 30’s, as many as 3,000 store fronts and buying clubs existed in California alone, but few of these remain today. Those that still exist are know as ‘old wave’ co-ops and tend to be larger and more business-like. Co-ops that cropped up in the 60’s tended to adopt strong political and social positions on issues such as whole and natural foods. These ‘new wave’ co-ops were not as business oriented as their parent co-ops of the 30’s. In the 1970’s a ‘third wave’ was born – a uniting of the two co-ops. They maintained many social and political aims of the new wave but accepted the business orientation as crucial to their survival. Sorting bulk products (and a few photo bombers).